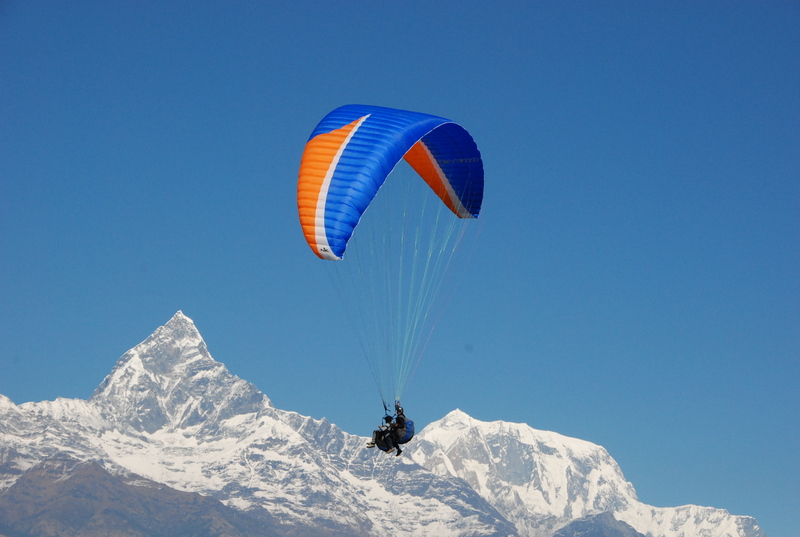 Paragliding in Nepal can be a truly wonderful and fulfilling experience for the adventure seeker. A trip will take you over some of the best scenery on earth, as you share airspace with Himalayan griffin vultures, eagles, kites. And float over villages, monasteries, temples, lakes and jungle, with a fantastic view of the majestic Himalaya . Gliding is a weather dependent sports and the flying season in Nepal commences from November through February, the best months being November and December. The takes off point for these flights is Sarankot ‘(1592m. ), which also offers prime views of Fewa lake and mountains at sunrise and sunset (provided the skies are clear) and the landing is by the Fewa lake. Observing glory of Annapurna range and beautiful landscape around Pokhara valley, virgin Mt; Fishtail (Machhapuchhre), Lamjung Himal, Annapaurna Himal,.And Himchuli, Fewa Lake, Rice field, Rivers and settlements are below gives you thrills with a great photographic opportunity.Fly once in Pokhara to make your dream come true no previous experience is required as qualified pilots provide a short briefing before launching . Day 05: Sightseeing in Kathmandu city hotel BB.